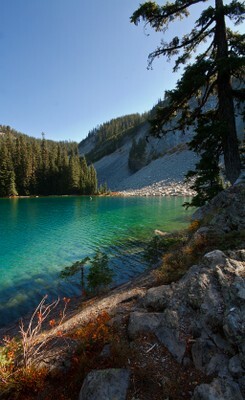 Description: The Indigo Lake Trail (#3549) winds through old growth trees and high mountain meadows before arriving at its namesake lake. From here, there are beautiful views of the intensely blue waters and of the jagged Sawtooth Ridge that rises over the lake. There is plenty of opportunity for solitude for those who backpack in to the small and remote campground near the lake. Be warned that after the snow melts, and typically through the end of July, the mosquitos are merciless. Once at the lake it's worth hiking the loop around the lake that begins at the entrance of the campground. Directions: From Eugene, continue south on Highway 58 continuing two miles east of Oakridge. Turn right onto Kit Springs Road and turn right again onto Forest Service Road 21. Continue on FS Road 21 for 32 miles and then turn left onto Road 2154. From there follow 2154 to Timpanogas Campground. The trailhead is adjacent to the campground. The road is a decently maintained gravel road and is doable in a small sedan.